Eating nuts supplies you with protein, fiber and healthy fats and also helps you meet your daily needs for magnesium and potassium. 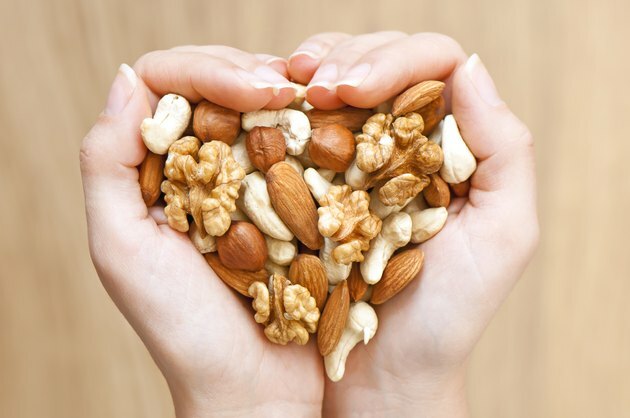 However, most nuts are a better source of magnesium than potassium. These minerals are essential for fluid balance, muscle and nerve function, protein synthesis, blood sugar control, blood pressure regulation, strong bones and a normal heart rhythm. Men need at least 420 milligrams of magnesium per day and women need at least 320 milligrams, according to the Institute of Medicine. Both men and women need at least 4,700 milligrams of potassium daily. Because they are high in healthy fats, nuts are a concentrated source of calories, so limiting yourself to one portion is a good idea. The U.S. Department of Agriculture notes that almonds are a good source of both magnesium and potassium. 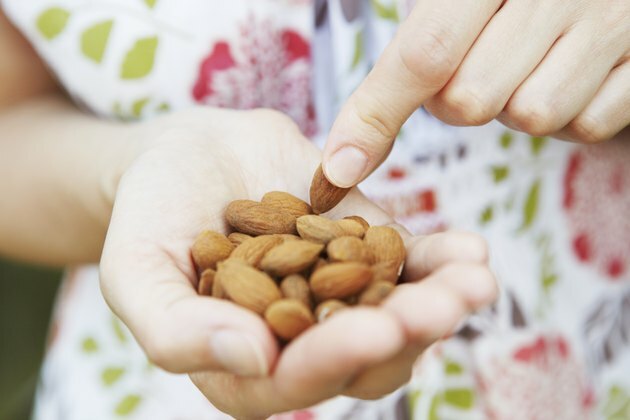 From one-third cup of almonds you'll get roughly 349 milligrams of potassium and about 129 milligrams of magnesium. Eating a serving of almonds per day meets about 7 percent of your need for potassium and 31 to 40 percent of your need for magnesium. The nutritional values vary only slightly whether you choose to eat them raw, roasted or blanched. Cashew nuts are another way to get both magnesium and potassium. A one-third cup serving of roasted cashews contains 272 milligrams of potassium, or 6 percent of your daily need. You'll also get about 117 milligrams of magnesium, which meets 28 to 36 percent of your daily need. 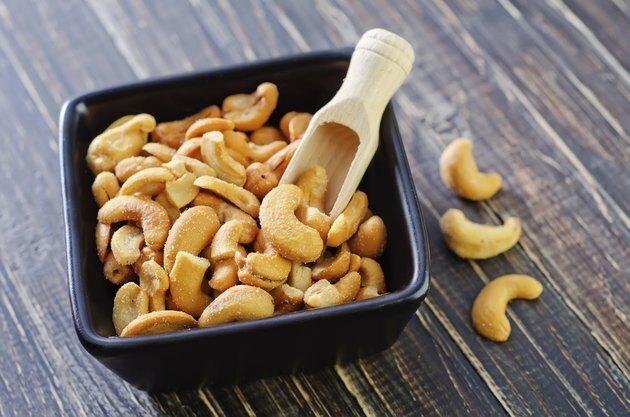 For the least amount of added fat and sodium, choose unsalted, dry-roasted cashews. They make a great snack on their own or can be added to salads or stir fries for extra nutrients and crunch. Brazil nuts are a less common nut that grow on giant trees in the Amazon jungle in South America. They're larger than most nuts and have a rich, creamy flavor. Eating a one-third-cup serving gives you 167 milligrams of magnesium and 292 milligrams of potassium. This meets 6 percent of your need for potassium and 40 to 52 percent of your need for magnesium. 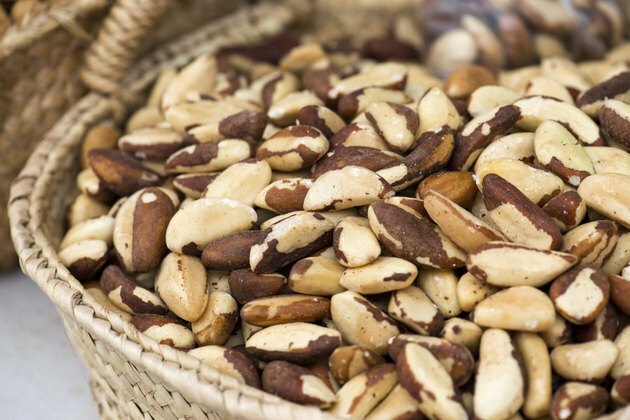 You can find Brazil nuts in many bulk food sections and they're commonly added to deluxe mixed nut blends. You can also eat raw or roasted pistachios or dried pine nuts to get more of these minerals. 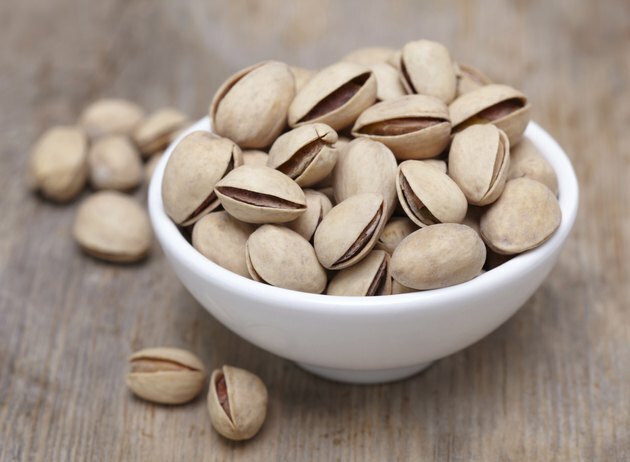 one-third-cup serving of pistachios gives you roughly 420 milligrams of potassium and 50 milligrams of magnesium, which meets about 9 percent and 12 to 16 percent of your needs respectively. From one-third cup of pine nuts you'll get 269 milligrams of potassium, or 6 percent of your daily need, and 113 milligrams of magnesium, or 27 to 35 percent of your daily need. Many seeds, while not technically nuts, provide both minerals as well. 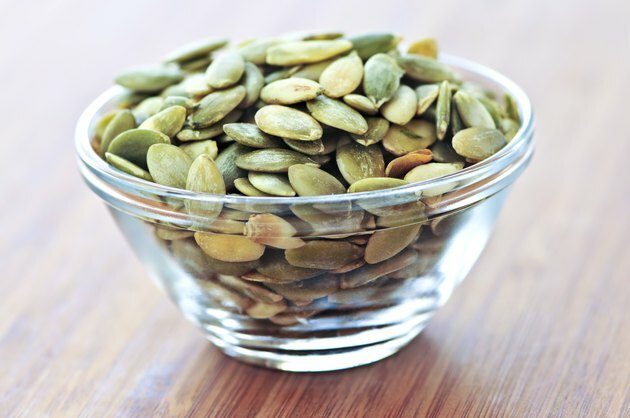 Roasted pumpkin seeds provide about 147 milligrams of potassium and 42 milligrams of magnesium per one-quarter-cup serving. A one-quarter-cup serving of sesame seeds gives you 126 milligrams of magnesium and 168 milligrams of potassium. Sunflower seeds also provide 44 milligrams of magnesium and 165 milligrams of potassium per one-quarter cup. Can Pregnant Women Eat Pistachio Nuts? Are Honey Roasted Nuts Healthy?